The European Urban Media Network Connecting Cities is a network with the aim of creating an exchange between urban activists, creatives, passers-by and city inhabitants from all over the world via media façades and large digital screens. 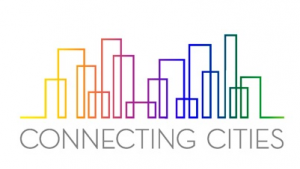 As an interdisciplinary network, Connecting Cities unites political, economic and artistic interests. The initiator of the project is Public Art Lab (Berlin) in cooperation with Ars Electronica Futurelab Linz, BIS (Body Process Arts Association) Istanbul, FACT Liverpool, iMAL Brussels, m-cult Helsinki, Medialab Prado Madrid, Media Architecture Institute Vienna, Museum of Contemporary Art Zagreb, Riga 2014 and Videospread Marseille. Other partners include the Aarhus University, Marseille-Provence 2013, MUTEK Montréal and Quartier des spectacles Montréal. We approach our vision of Connecting Cities 2012 – 2016 through three scenarios: Networked City 2013: The European cities can be connected through Urban Media Facades, which provide space for intercultural encounters and exchange. Challenging questions for the Networked City 2013:Can urban media facades become a catalyst for shared encounters in an identity-creating temporary field of interaction across the borders of time and distance? How can we use art projects to connect the local public virtually with the other places? What are the expectations and visions of our European neighbours? Participatory City 2014: Through the use of interactive technologies, the European citizens participate directly in artistic Urban Media projects. They play an active role instead of being passive consumers. Challenging questions for the Participatory City 2014:How can we open the screens as digital stages for public interventions? What is the impact of participatory projects realised in the European space on audience and community development of the European neighbourhoods? Visible City 2015: Urban Media Facades are the interfaces and membranes that absorb, analyse and display societal flows and processes in real-time. The digital sensor networks and infrastructures that underlie our daily life become visualised. Challenging questions for the Visible City 2015:How can we make social, environmental and intercultural processes visible and use the screens as black boards and visualization zones? What is the impact on the society, when invisible structures that underlie our daily life get visualised? What is the potential to create public awareness? http://www.connectingcities.net/ Connecting Cities Network is funded by the Culture Programme 2007-2013 of the European Union.